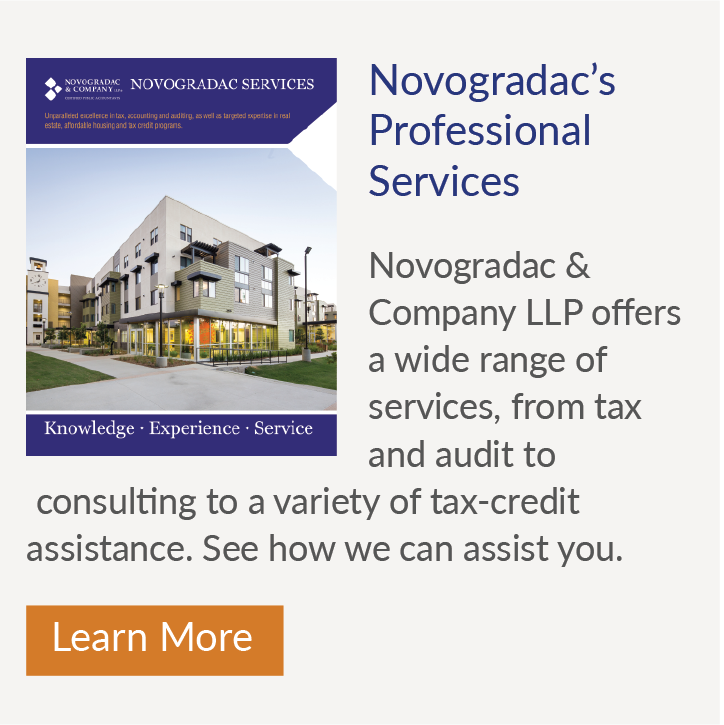 Novogradac & Company LLP offers a full range of audit and tax services to clients, most notably in the real estate and community development field. We also work with nonprofits, government agencies, development and construction companies, securities firms and more. Novogradac & Company LLP offers services to help ensure that low-income housing properties maintain compliance with regulatory requirements. The services are provided on behalf of investors, general partners and management companies of properties throughout the nation. Novogradac & Company LLP provides consulting services specifically relating to affordable housing and community development, as well as general consulting services for other industries. The firm’s professionals are able to assist with cost-segregation reports, tax-compliance assistance, risk management services and much more. Novogradac & Company LLP provides comprehensive real estate advisory services to all levels of government, as well as the private sector. Services range from real estate appraisal and market research to evaluating potential opportunities with federal land and more. Novogradac & Company LLP has industry-leading understanding of the low-income housing tax credit (LIHTC) based on decades of expertise, with services for nonprofits, for-profit corporations, governmental housing authorities, state finance agencies and others. Novogradac offers extensive experience in all aspects of the new market tax credit (NMTC), with extensive technical knowledge and experience. Novogradac can help guide you through tax, structuring and business issues, while focusing on your business objectives. Novogradac is an established Opportunity Zones leader with expert technical knowledge of key tax, accounting, transaction structuring and compliance issues. We are dedicated to helping communities grow and thrive. Novogradac will help guide you through the underlying tax, structuring and valuation issues of OZ investments. Novogradac & Company LLP is a leading expert in the renewable energy tax credit finance industry. We provide value-added services based on innovative thinking and a comprehensive understanding of the business, tax and structuring issues in renewable energy transactions. Novogradac & Company LLP offers both new and experienced developers a range of professional services to help with the challenges within the historic tax credit (HTC). From the development and application process through compliance, we provide comprehensive historic rehabilitation tax and consulting services. Novogradac & Company LLP offers developers, owners and property managers a broad range of professional services to assist in the challenges within the Department of Housing and Urban Development (HUD) multifamily housing arena. Novogradac & Company LLP provides nonprofit clients with a team of individuals who are knowledgeable and experienced in the issues that face nonprofit organizations. We understand the regulatory environment for nonprofits, whether in affordable housing, community development or elsewhere. Novogradac & Company LLP offers a range of services to assist public housing authorities navigate the challenges and intricacies of providing affordable housing. We offer the knowledge and dedication to tackle the complexities of public housing programs and HUD’s multifamily rental programs. Novogradac & Company LLP provides expert assistance in navigating Year 15 issues for low-income housing tax credit (LIHTC) properties. We offer proven solutions to complicated deals and meet clients’ need for direction at Year 15. Novogradac & Company LLP provides specialized knowledge about cost segregation for individual components of a property. That results in significant tax benefits by using shorter recovery periods and accelerated depreciation methods for computing depreciation deductions. Novogradac & Company LLP provides litigation support and expert witness testimony for situations requiring a specialist recognized by the court as having expert knowledge about evidence in a legal case. Many of the firm's partners have frequently served as expert witnesses. Novogradac & Company LLP offers an in-depth understanding of the key issues and challenges facing the wine industry. We provide owners, investors, lenders and growers with comprehensive knowledge of market, legislative, environmental and financial issues. Novogradac & Company LLP provides services in defeasance transactions to help ensure that the securities being used to defease a loan are sufficient to meet the required principal and interest payments.